Could Personal Videos Become the Heart of College Applications? The college admissions game is intense, competitive and, some would say, out of control. Now one Maryland college is looking to make it a little bit simpler. Goucher College, a liberal arts school in Baltimore, is offering students the opportunity to skip submitting standardized SAT and ACT scores, as well as the traditional college application packet that includes a transcript, letters of recommendation and essays. 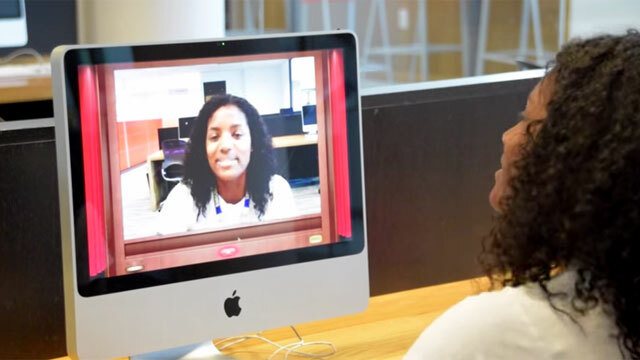 Instead, students can apply with a self-produced, two-minute video that explains how they see themselves thriving at Goucher, and why they want to go there. Students are also asked to submit two "works of scholarship." "The college admissions process is broken. The application process is complicated; it's stressful," says José Bowen, who took over as president of Goucher in July. "Video is where everybody's at," he adds. "High school students who might not have a laptop, they might not have a way to write their essay and get their parents to edit it. But they probably have a phone, and they understand how to use the phone to make a video." Bowen says he hopes the new approach will increase the "diversity of thought" on campus. "In my own experience, the SAT ... is not an absolute measure of potential," he says. "It mostly tells us about your previous performance, and it tells us quite a bit about your parental background." While getting students to apply who might not typically fill out a traditional application to Goucher is one goal, a second is likely just getting more students on campus. There were 3,615 applications to be part of Goucher's fall 2012 freshman class. Goucher admitted 72 percent of them. But of those admitted, just 16 percent enrolled, according to the school's admissions office. Goucher isn't the first to accept self-produced videos. Tufts University first gave students the opportunity to include YouTube videos as supplements to their applications in 2010. That first year, about 1,000 of the 15,000 students who applied submitted videos. They were a mix of whimsy that included singing, performance art and even one that combined math and ballet. But Goucher may be the first school to supplant the traditional application with one. Which raises the question: Will students start paying for production assistance and slick editing, in the same way many now pay to polish their essays or prep for standardized tests? Bowen says students won't be evaluated on production quality. According to a rubric posted on Goucher's website, students will be scored on their content/thoughtfulness, the structure and organization of the video, and the clarity and effectiveness. "We're being specific that 'lights, camera, action,' is not going to help," Bowen says. "We're going to be looking at you and what you have to say. You can use a cellphone; you don't need a fancy camera." So, in other words, no pulling an Elle Woods. Robert Sternberg, a Cornell University professor and former dean of arts and sciences at Tufts, is a big believer in overhauling a college admissions process that he says lacks creativity and doesn't serve students well. He says Goucher is making a step in the right direction by introducing new ways to allow students to say who they really are. But, he warned, video applications might backfire for some students. "It puts an emphasis on how well you perform for a camera," says Sternberg, the author of College Admissions for the 21st Century. "Unfortunately, people can't help things like interpersonal skills and attractiveness." And video could lead to bias, Sternberg says, based on how applicants look, how they dress, or how they present themselves on camera. "The best admissions process," Sternberg says, "is always going to be one that uses multiple measures, so you hope to cancel out the bias. People have unconscious racial biases or gender biases that they're not aware of." Bowen says he's well-aware of those concerns. To guard against bias, he says applications will be screened by a "very diverse recruitment force," as well as members of the faculty. And students will still have the option to pass on the video and submit a more traditional application. Rebecca Rother, who graduated from Goucher in December 2011, says that if a video had been an option when she applied, she wouldn't have used it. "I'm not a very creative person in terms of the opportunity to stand in front of a camera and make that happen, so for me the essay was the way to go," she says. "I'm also a traditionalist; I follow the rules really well. This would be a little outside of my rule-following.